FUE Transplant or Follicular Unit Extraction is another version of Follicular Unit Transplantation in which the hair grafts are obtained individually from donor area of the scalp. Harvesting hair follicular units was first introduced to hair restoration surgery field by Dr. Woods. FUE transplant was perfected by others such as Dr. William Rassman and Robert Bernstein. FUE has many pros and cons in comparison to the strip method of follicular unit transplantation. The disadvantage of FUE is that a patient’s donor hair needs to be clipped very short prior to the procedure. The wound spots where hair follicular units are harvested may appear as small red dots for a few days, which generally heal completely with minimal visibility within the first week after hair transplant surgery. The other disadvantage of hair transplant through FUE technique is that some patients may not be good candidates for it. 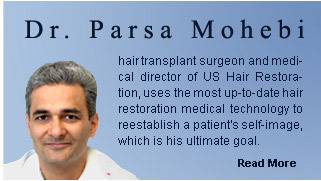 We at Parsa Mohebi Hair Restoration test every one (FOX test) before proceeding with a formal FUE procedure. Follicular Unit Extraction (FUE), also called Follicular Isolation Technique (FIT). is basically another variety of FUT (Follicular Unit Transplant) in which the method of harvesting grafts is different, but there is no difference in implanting the hair grafts in the recepient area. The advantage of FUE is that the patients will not have a linear scar on the back of their head. FUE or FIT does not leave patient a linear scar because we do not remove the skin strip from the donor area. Donor complications such as discomfort in the donor area after surgery, the need for staple or suture removal and presence of the linear scar are not seen with the FUE transplant. View of Recipient and donor area in FUE transplant, immediately after an FUE hair transplant with 1500 grafts. FUE is the best hair transplant procedur for people who want to style their hair short on back. Follicular Unit Extraction is also the first choice for those who previously had healing problems with previous hair transplant or other scalp procedures. Not every patient can be a good candidate for the FUE procedure. We strongly advise testing every patient who is considered for a FUE transplant through FOX test. Almost every patient who is considering hair transplant through FUE need to be tested by several FUE punch devices. We generally perform a few biopsies under local anesthesia trying to extract the follicular units intact. The harvested grafts are examined microscopically for their integrity. The patient is considered FOX positive (good candidate for a FUE transplant) is the one who we are certaine about harvesting the follicular graft with minimal transection rate. Patient who are not positive for FOX test with one method may be positive for the other ones. Most people with straight hair or slight wavy hair are FOX positive while patients with very curly hair are having higher chance to be FOX negative (not a proper dandidate for hair transplant through FUE).